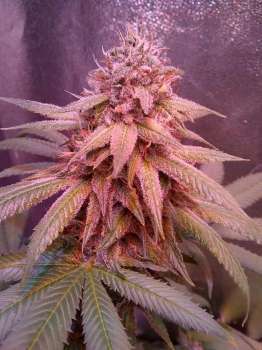 Here you can find a strain description about Rusty Glue and also some user-based reviews and infos directly from the SeedFinder (if available). You can also find the offers and auctions here if Rusty Glue cannabis seeds are on stock at MyCannapot right now. Rusty Glue F2 (Rusty OG F2 x Jedi Glue F2) an Indica hybrid F2 strain, crossed from the PTP (purple) pheno of Rusty OG, is a very frosty and very potent strain grown indoors or outdoors. This powerful indica hybrid is very popular among medical cannabis users for it's high THC potential and awesome taste. Couch-lock is unavoidable as the high hits you instantly, and yet it still keeps creeping until you are completely stoned in a heavy body high. She has a spicy, sweet kush flavor with an earthy aftertaste. The aroma is a strong kush smell. Rusty Glue can reach THC levels reach up to 30% on average for outdoor and even higher for indoor. Rusty Glue will get very big outdoors but it's a heavy yielder indoors as well. This tasty indica medicine is very good for pain, stress, insomnia, and nausea. Also good for PTSD. Flowering period is about 8 to 9 weeks..
Buy Rusty Glue now at MyCannapot!